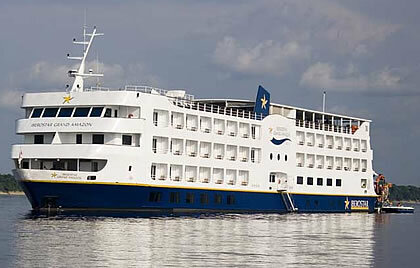 The Iberostar Grand Amazon provides the perfect combination of luxury, comfort and style for cruising the Amazon river. This five-star ship is akin to a floating hotel that offers an array of amenities. Each spacious cabin comes equipped with a private bathroom, air-conditioning, a minibar, tv and safe. Private balconies provide a magnificent view of the scenery. The restaurants onboard blend local Brazilian cuisine with international fare. Passengers can attend daily lectures on various Amazon topics, partake in dance classes or unwind in the Jacuzzi. Shore excursions offer the opportunity to explore the Amazon Basin.